If you haven't got yourself a Facebook Author's page then you are losing out as a writer. We spend a lot of time on Twitter and writing blog posts to build up a following, in the hope that these people might just buy our books and spread the word about us. I know I do, my Twitter account currently has just under 6000 followers. Big numbers, eh? But that's nothing compared to my Facebook page, which was a lot easier to do and is far less time consuming. Maybe you hate Facebook and refuse even to contemplate opening a profile? Maybe you are an addict? 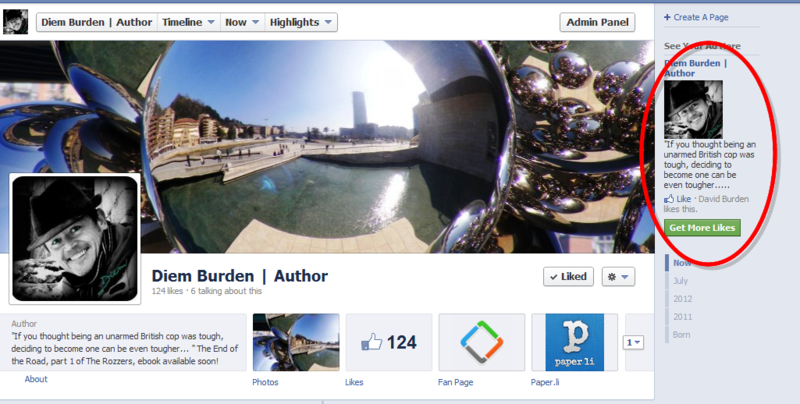 As an author, whatever your views, you must get yourself a Facebook page for promotion purposes. I'll tell you why in a minute. Give it a url name associated with you. For example mine is https://www.facebook.com/DiemBurden. Easy to remember, easy to promote. Once you have set up your page invite your Facebook/Twitter friends to visit the page and 'like' it. They will need a FB account to do this. You don't have to be friends with them on FB for them to like your page, and you cannot access their profile unless you become 'friends'. You will soon see the numbers begin to grow. Once you have 30 likers, you will be able to access the stats (called insights on FB), and this is where it really begins to get interesting. My numbers have risen steadily, and the first thing I did to get going was to invite my personal FB friends to like the page (I have 167 personal friends). 69 of them obliged, and 55 others from Twitter etc came across and liked it too. So now I have a total of 124 people who have liked my page since I opened it 11 months ago. I know what you are thinking, 124? That's not impressive. It is, believe me. I'll tell you why but before I do let me tell you what this liking of the page achieves. Whenever I post something on my page, it appears in the timeline of all of the 124 people who have liked the page. For this reason I don't duplicate it by posting it on my personal page too, as my friends and likers won't appreciate it twice! Usually I post something that 'encourages' them to either comment on my post or to like the post. If they do, this does two things for me. First, that post then appears on their own timeline, and is instantly visible to everybody who is friends with them too, ie people who are nothing to do with me or my page (a bit like a retweet). 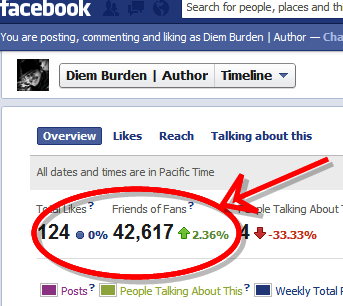 On average, my 124 likers have 344 friends each. So if just one person acts on my post, it gets punted out to about 124 strangers, who all get to see my post/name/brand. Some then visit my page and end up hitting the like button too. That's another 124 friends of a liker, thank you very much. The more people who comment/like the post, the longer it stays at the top of the timelines (FB timeline defaults to 'top stories', so those with the most comments/likes appear at the top of the timeline for longer, so more people get to see it. Feel free to open up a conversation in your post!). Let me repeat that, one hundred and forty-two thousand potential customers. Makes my Twitter account seem like chicken-feed! And remember, each new liker brings with them all of their friends. It is down to you what you do with them. The numbers are potentially so big I've decided to use FB page as my principle page. By that I mean I want as many likers as possible on here, just so that I get to reach their friends too. So I use it by rewarding these people with promotional copies, news first etc and I ONLY write about me and my books. I don't want people to get bored with my mundane life - that's what FB personal pages are for! I am not overly-promoting my page yet, and when I do I expect to see the amount of likers grow considerably, and with it, the amount of 'friends of fans' exponentially. There are various other advantages to FB pages which I won't go into here. The stats are amazing, and if you want to know more about how to read that info I recommend visiting this really useful post by John Haydon. I did an experiment with FB advertising too. I set the maximum fee to $30 and designed my advert. I arranged for the advert to appear to Facebookers who had a friend who had liked my author's page. It was an interesting experiment and something that I will post about once the figures have been analysed. You can see an example on the right-hand side of screenshot 1 above. So, you're probably slaving away on Twitter to build up a following, whilst ignoring the simple - yet priceless - Facebook page. Come on, what are you waiting for..? I'm not very good at writing. The truth is, as a writer I'm not very good at writing. By that I mean the actual act of writing, not the result. I like to think that when I actually produce something it is quite good. In truth, I haven't put finger to keyboard for several weeks now. It makes me look like a wannabe writer. Why is this? Routine! I produce the most when I have a set routine. A routine gets books written. Take me out of that routine and diddly-squit happens. It all went to pot when I spent a couple of weeks in the UK close to London, just prior to the start of the Olympic Games. There I experienced something which I haven't experienced since 1982 - British pride and British self-belief. I even visited some of the venues to take a ganders at what it was all about. It was amazing - the atmosphere was buzzing. Following on closely from the Queen's Jubilee celebrations, had my people found a new Britishness in the run up to the 2012 London Games? On returning back to Spain I eagerly awaited the opening of the games; the first time ever for me. That opening ceremony blew me away - it was so British, so us. It brought a tear to my eye, a lump to my throat and a long-forgotten pride to my heart. I then followed the exploits of Team GB, something I'd only ever paid scant attention to on previous occasions. I was soon hooked. Who were these guys? I didn't know their names or recognise their faces. That's what living in a place like Spain does for you. The only contact I had had with Team GB prior to the opening ceremony was in Madam Tussauds, where the only waxwork to really get my attention was that of a British female athlete (see pic below). I knew she was British from the Union Flag she had stretched out behind her, and her amazingly designed sports kit. Yet I had no idea who she was, but boy did she look good, even in wax. The closing ceremony was as amazing as the opening, although I do think we have greater musical talent to offer to the world than the Spice Girls. And now it's all finished. The competitors are heading home, the venues are being dismantled and the world is talking positively about London 2012. So now it's back to a routine. My wife is away for 5 weeks and I am alone to do as I please. The floor needs sweeping; the dishwasher needs emptying; the car is in desperate need of a clean inside and out etc etc. And that's just for starters. But now it's me time - or more correctly writing time. Anyway, from my observations sat here at my computer, the breeze blows all the crap on the floor into one corner of the room; the dishwasher can be emptied as and when I need an item from it; the car's out of view in the garage and anyway, I can use my motor-bike for now.